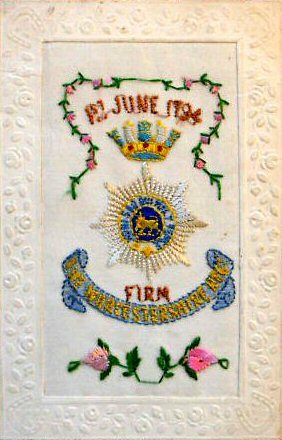 Here are a few examples of silk postcards used by Worcestershire Regiment men to send back home to their wives and loved ones. 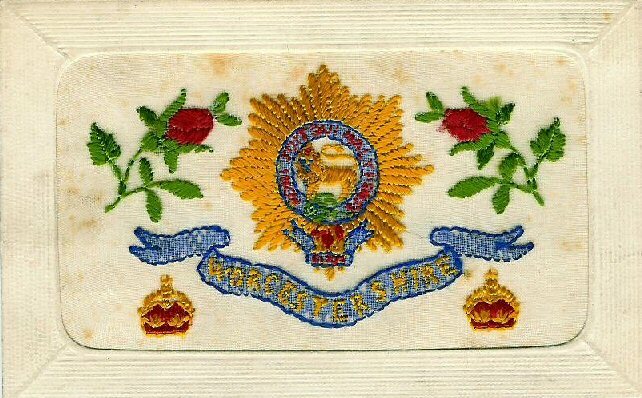 During the 1914-18 First World War silk postcards and handkerchiefs were bought as souvenirs by soldiers who were serving on the Western Front. Local French and Belgian women (it was common for Nuns in convents) embroidered the different motifs onto strips of silk mesh which were sent to factories for cutting and mounting on postcards. 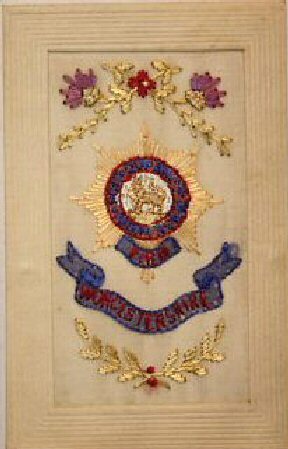 There were two types of cards which were used, one was a piece of embroidered silk mounted onto a card and the other was two pieces of silk sewn and mounted to form a pocket to contain a message or a silk handkerchief. These silk postcards are a good example of an industry which started as a result of the war and was a useful source of income for local families in France and Belgium. Soldiers usually wrote a message on the back. It is rare to find these cards actually posted. Most cards do not have postage stamps on them as they were mailed home in envelopes. Although, initially these silk postcards were woven by hand, towards the end of 1914-18 World War demand was so high that the designs for the postcards were produced on small machine operated looms. 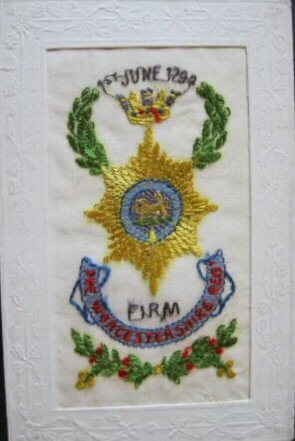 The silk designs were fixed to a postcard backing and then attached into place with a cardboard frame. The quality and handwork of these woven cards was high. Even today, after nearly a hundred years, the colours in the embroidered patterns remains. 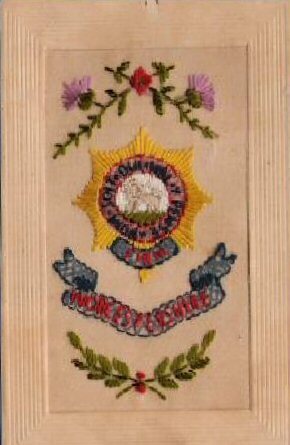 The earliest types of these silk postcards are now referred to as Hearts and Flowers. They often depicted forget-me-nots, pansies and bluebirds. Later versions of these cards had small flaps, under which a small message card was inserted. 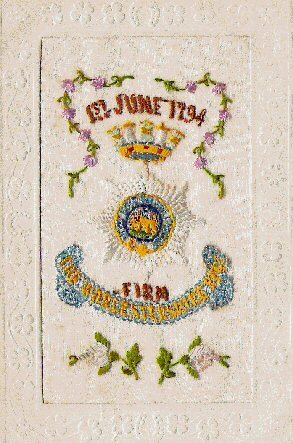 As the war progressed these postcards became Patriotic and usually had flags and patriotic messages embroidered on them as well. 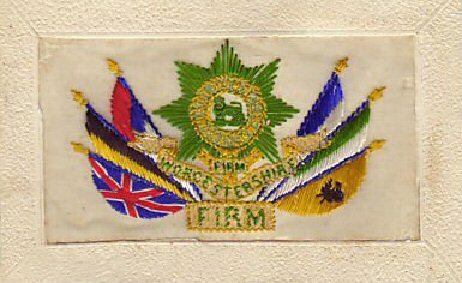 During the later stages of the war these postcards started to depict regimental badges and mottos, as shown here by the the examples. These are less common now than the earlier versions as fewer of them were made. Today they are quite popular with collectors and some of the rarer versions can fetch quite high prices. Over the duration of the 1914-18 War it is estimated that several million of these cards were bought and sent. Although, they continued to be produced after the war ended, they never regained the popularity.